At a soft launch in Maison et Objet in Paris in September, SBID announced a collaboration with property and infrastructure service provider Lend Lease to develop the East London Stratford site which has been home to the 2012 Olympics and Paralympics Games. 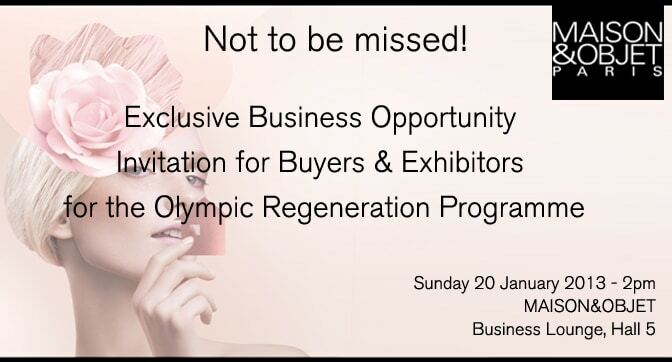 SBID President Vanessa Brady will be there again on Sunday 20 January at 2pm at the Business Lounge of MAISON&OBJET to offer the attending international professionals the opportunity to join this exciting project. Maison & Objet is also offering FREE TICKETS TO SBID MEMBERS to attend the show from 18 to 22 January 2013, in Paris, France. Email [email protected]id.org for further information and book your ticket.